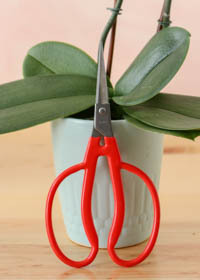 Is Your Orchid’s Pot Killing Your Orchid? 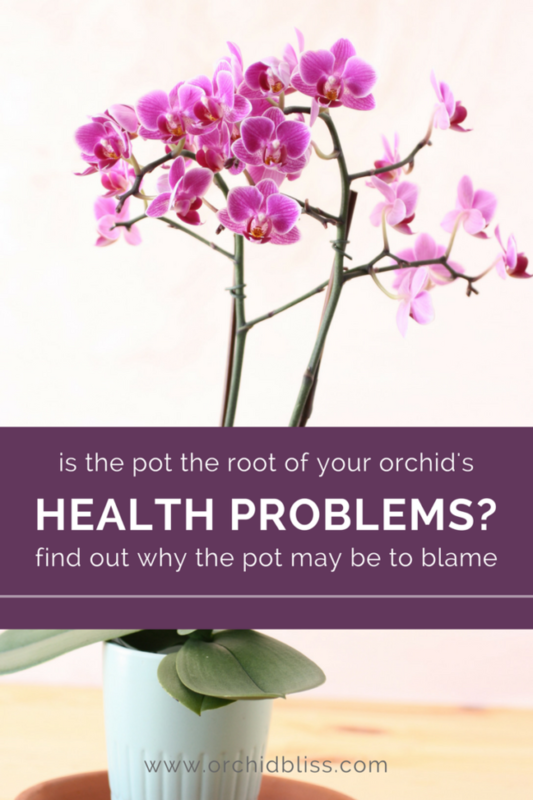 If your orchid isn’t thriving, the pot may be the culprit. 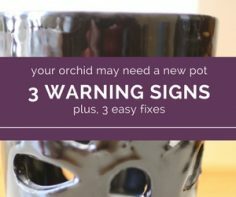 Here are 3 things to watch for to make sure your orchids have the right pot. Orchids need light, which is why we set them close to windows. This is a good thing, unless the dark color of the pot absorbs too much heat from the sun. I learned this lesson the hard way. I have two mini cattleya orchids that I re-potted. One was re-potted into a dark cobalt blue pot and the other into a shiny black orchid pot. I re-potted the orchids in pots with lots of holes on the side for plenty of drainage. It wasn’t long before the roots came snaking out the holes. I was delighted by the bright, green healthy tips of the roots. My experience with my cattleyas got me thinking about my other orchids. I set my orchids with high light requirements, like my dendrobium, in light colored pots. 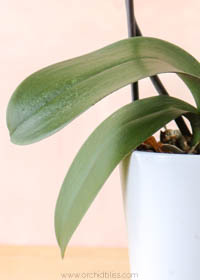 Paphiopedlium and phalaenopsis have lower light requirements and do best a few feet away from windows. Those lower light orchids are doing great in dark colored pots. 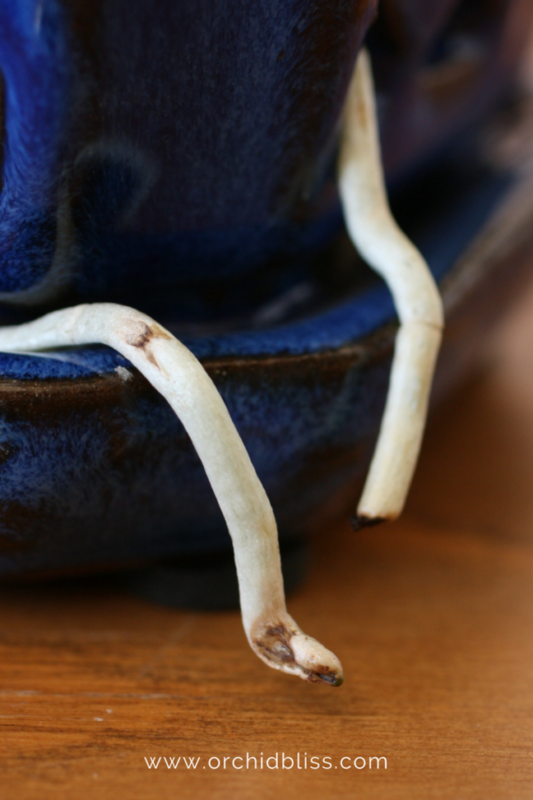 The dark colored pot absorbed the heat of the sun streaming through the window and burned this orchid’s roots. Sometimes even if you’re using the right orchid pot, you may need to adjust the location-in this case grow-lights was the answer. My cattleya orchids have been under the grow-lights for several months and the roots are doing fine, putting out new growth, and, I hope, getting ready to bloom. Cattleya orchids require lots of light, so moving the orchid to a lower light location was not an option. This is the same orchid, now under grow-lights. The roots are much healthier away from the heat of the sun’s rays. 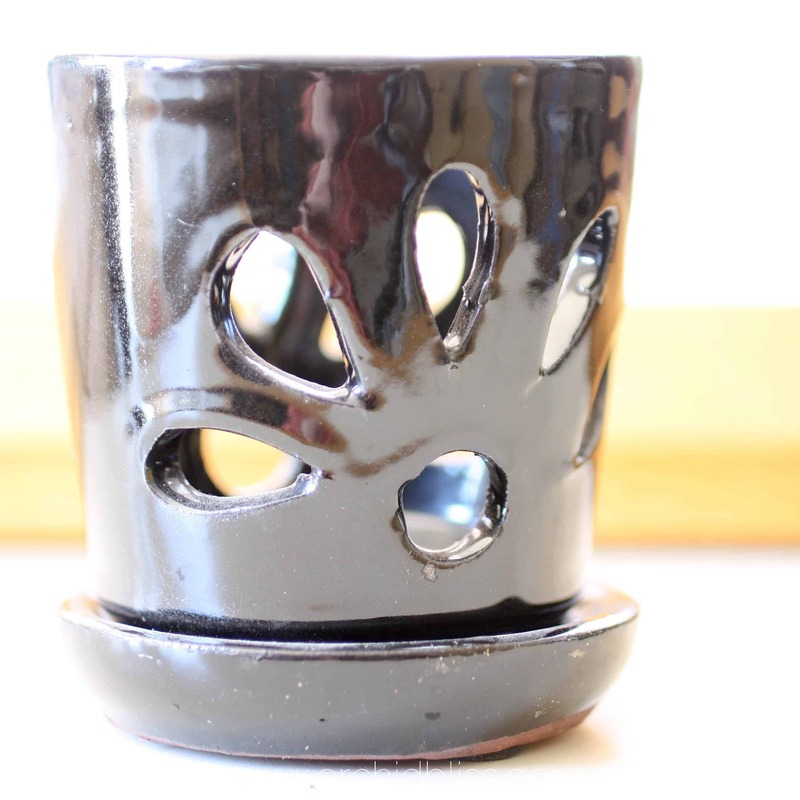 Another common problem that leads to orchid problems are pots without drainage holes. This happens most commonly when buying pre-made orchid displays. 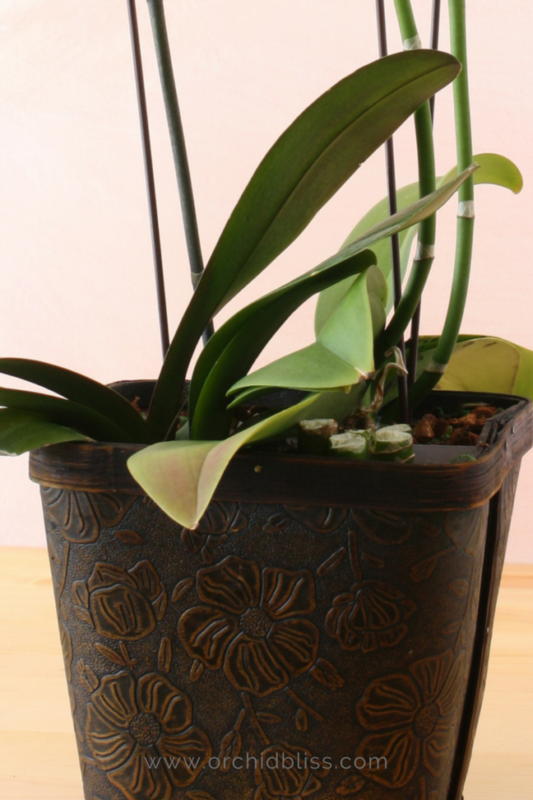 In this situation, several orchids are placed in the same pot–one without drainage holes. I have purchased orchids like this. The orchids were planted in a basket lined in plastic. To solve the drainage problem I busted the bottom of the basket-and I don’t mind telling you that it took a little muscle to get it out. Then, with a knife I sliced several holes in the plastic lining to allow excess water to drain out. I set the display on a plate to protect my furniture surface. The orchid has been in bloom for a LONG TIME, but once it finishes blooming I will re-pot them in their own separate pots, complete with plenty of drainage. Buyer Beware: this orchid arrangement had no drainage. Like Goldilocks, orchids like things “just right.” While orchids love being a little crowded in their pots, every year or two it’s time to re-pot. Just as an orchid won’t preform at their best if their pot is over-crowded, a too large pot will also inhibit flowering. The best time to re-pot is just after the orchid has finished blooming. 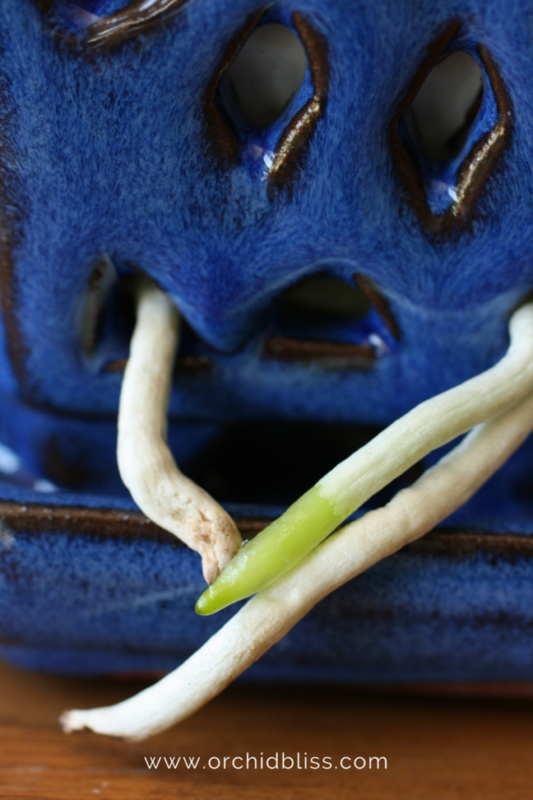 This is when the orchid is ready shift gears and put their energy into their root systems. Select a pot just slightly larger than their former pot, one with plenty of drainage, and one that isn’t too dark. Generally, I like to use a clear pot so that I can see the roots. Then I slip the clear pot into another (light-colored) pot. This brassia orchid has just finished blooming and is putting out new growth, indicating a good time to re-pot. Asses your orchid pots. Are your orchids over-heated, over-watered, or over-crowded? The answer may to try a new, lighter colored pot, or it may be time to move the orchid under grow lights, or your solution may be to to re-pot your orchid in a pot with drainage. With the right orchid pot, your orchid will have the best odds for health and vitality. It sounds like the orchid is doing well with lots of new growth. Orchid roots will die if they sit in water. The roots will soon grow down into the pebbles and then rot. I recommend using a pot with drainage. Pot the orchid in an orchid potting mix. 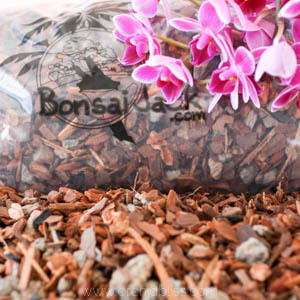 Bonsai Jack offers a high quality orchid mix. Hi Raekay, have you looked at growing orchids via water culture ? Basically it’s hydroponics and you use glass vases, jars, anything transparent; my orchids converted to this a year old ago are thriving, some are on their second blooming in a few months. I have moved from Fl to the Mts in Ga. My orchids were beautiful there. I now keep them in the house, they are not doing well. Any advice as to how to grow them in the house. Orchids can be extremely adaptable-though waiting for them to adapt can be painful. Growing them indoors is definitely a new ballgame than growing them outdoors in an ideal environment like FL. Indoors, orchids need plenty of air circulation. While the amount of light varies depending on the variety of orchid, be careful not to set the orchid too close to your window as the intense light could burn their leaves. This post on properly watering orchids may also help you out. Also, by signing up for my email list via the Orchid Love Quiz, you will receive additional information and free downloads on caring for orchids indoors. I hope this helps! I wish you the best of everything in GA for you and your orchids. Thank you very much for your helpful hints! I appreciate the hints on this site for my orchids. I love it! Thanks so much Janet! I was at Lowe’s and saw these gorgeous hanging orchids with roots three and four feet long hanging straight down. They were very expensive so I couldn’t afford them. I have two mini sized Cattleya orchids that I bought……just a few baby sized roots and three or four thin little elongated leaves. Can I make these little orchids hang like the ones at Lowe’s? I’m guessing the gorgeous orchids you saw at Lowe’s were Vandas. They are indeed stunning. I’m sorry to say, but Cattleya roots aren’t like Vanda roots. 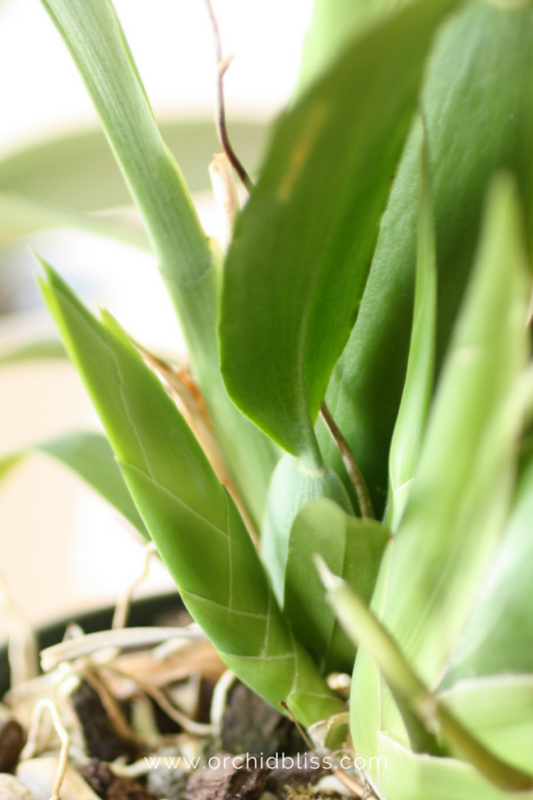 Cattleyas need to be potted or mounted, while Vandas grow primarily aerial roots that need daily misting or watering. Enjoy your Cattleyas–they are lovely as well! I have been reading your comments on growing orchids very helpful. Thanks for posting. 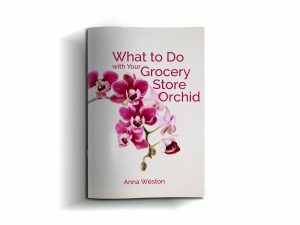 Let me know if you have any questions about growing orchids! How do I plant an orchid in a pot with holes all over? Doesn’t the dirt fall out of the holes? Use a medium size bark-based potting media. The mix is large enough that it won’t escape through the holes in the orchid pot. Fir-bark is the most popular potting medium for orchids. Fir bark is readily available and is a by-product of the logging industry. Fir bark becomes more water-retentive as time goes on and allows for air circulation around the orchid’s roots. Replace every 1-3 years, before it start to break down. I have enjoyed reading all your excellent information on orchids. This is so helpful. To avoid orchids that have been over-fertilized, attend orchid shows where you can talk personally with the orchid seller. Also, by purchasing orchids on Etsy you can contact the seller and ask them what their fertilizing practices are. As far as mass-market orchids, search the orchid distributors on Google then send them an email requesting more responsible care and fertilizing of their orchids. If you are losing your flowers it is due to an environmental stress. Follow the link below to learn more about bud blast. It’s is such a bummer when our orchids loose their flowers and we don’t know why. These tips will help you to prevent it from happening again. The pests that I have are what they call house lizards small grey ones that eat the tips of the vandas. What can I use to keep them away and other insects that nibble on the roots. I don’t have house lizards where I live, but It did find this post with 12 tips to get rid of them. Hopefully these tips will help with insects as well. Hi I saw a u tube vt on how to look after my Orchid. Now it’s in a plastic clear pot from Homebase. I cleaned the roots of compost and soaked it in clean water for a while then put it in pot with Orchid mix it’s chunky and the roots are all usable, so they get lots of light.